We are pleased to now be offering driving lessons in Birmingham, as we have welcomed a new driving instructor to our team to cover the Birmingham area. His name is Simon and is a fully qualified driving instructor who is trained to a very high standard. We are currently offering driving lessons in Handsworth, Aston, Winson Green, Smethwick, Oldbury, Quinton, Harbourne, Edgebaston Bartley Green, Selly Oak, Northfield, Stirchley, Kings Heath, Moseley and Rubery. We operate one of the largest private driving courses in the area, where under 17’s and nervous drivers can take their first driving lessons safely away from the public roads. You can start learning to drive as young as 14 years old, and you don’t even need a provisional driving license. The course is on private land, and it is ideal for nervous drivers as well as young people who want to get a head start by gaining experience of handling a vehicle before their 17th birthday. If you are interested in finding out more, please get in touch. We are a well-established driving school based in Dudley and covering a large part of the West Midlands area. We have a very high pass rate and a lot of our pupils were introduced to us by our ever-growing army of happy customers, many of who passed their driving test first time. 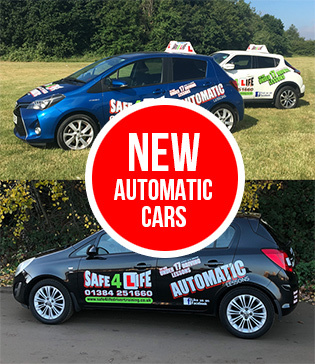 All of our driving instructors are very experienced, fully qualified and insured, and we offer driving lessons in clean, modern and comfortable vehicles. Why not take a look at our testimonials page, where you’ll find reviews from our past & existing learner drivers. There is no need to worry – most learners are nervous during their first few lessons. Our instructors are experts at making you feel at ease so that you can concentrate on the task in hand, which of course is to learn to drive safely. Our rates are very competitive and we also have various special offers to help make learning to drive even more affordable. Check out our current prices.